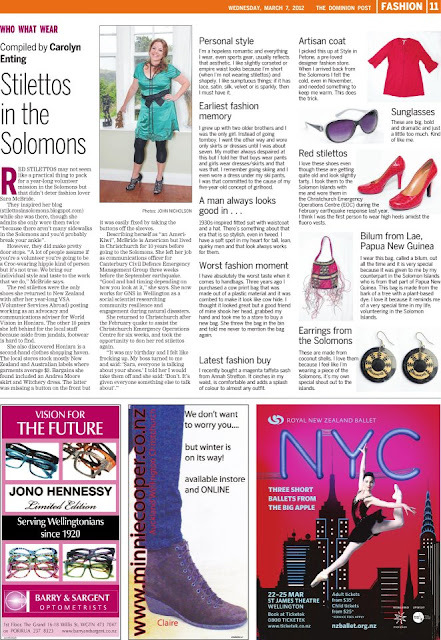 So, some of you might be coming here for the first time after seeing a Dominion Post article re: style in Solomons. After thinking about it, I realised that I kind of forgot to talk about it much in this blog! I had always intended to write a second hand shopping blog about the Solomons but lost inspiration. The article gave me a sort of kick up the bum to get it written. Here is how it works: clothes get sold or donated to a variety of charities in Australia and N.Z. These clothes make it through a number of shops but eventually get put into bales and shipped off to the Solomons. These bales are put together by quality of fabric, newness of clothes and a variety of other things. Shops in the Solomons purchase the bales and then place the clothing in either random order OR by skirts, tops etc...Bales typically come in on Saturdays and sometimes Mondays or Wednesdays. You will know when new bales are being opened because typically there is a large line of Solomon Islanders waiting for the shop to open. Typically there are days of the week when you can get half off of these clothes depending on the shops. Now, this will be slightly difficult for me because a lot of the shops have names, but I have no idea what they are AND I left four months ago, so the memory is starting to fade. Anyway, you were warned! Island Clothing: this shop across the street from the large BeMobile shop on the main street (kind of near the NPF plaza). Now, this use to be a rather bland shop but the owner has definitely made some good choices in bale purchases in the last four or five months I was there. The variety is very good, as is the quality of the clothes. I bought several designer items there that I still wear today, including a favorite black, jersey knit wrap dress. However, this is probably the most expensive Kaleko shop in town. XJ6: now this USED to be the best shop in town until it moved to the Rugby Stadium (note: it has moved again, across from Central Market. Thank you, sources!) Now the bales must be a lower grade because I used to go there three or four weeks in a row and find the same clothes on the rack. This is pretty unheard of in the Solomons; good clothes go quick! What IS good about XJ6 is that because the clothes are less desireable, there are some good winter picks there. I purchased a Leslie Herbert paisely skirt (which I just love) that no Solomon Islander would wear because its far too hot! Hidden Kaleko Shop: This is, by far, the best shop in Honiara...its near the NPF (the opposite end of the Huts) and in a little alley way, tucked away. Its also near the U.N. offices. This place is pretty good for finding Coutnry Road items and some great dresses (its where I picked up the little green dress in the picture of the Dom Post)! Plus they have new clothes in there as well. This place is clearly popular with locals, so get in quick. Seriously, the Hidden Kaleko shop is a real find; one I only found out about in my last few weeks in the Solomons. $5 Dollar shop: this place is upstairs in a pretty perilious looking building on the main strip across from the new Hyundia Plaza. This is a great place to find clothes for pretty much nothing...it makes for great party Dress up fodder...I found a great peach prom dress for an 80s party there. Honestly, you won't find much else there but at 5 dollars solomon an item, its probably with a go. Lei Clothing-Its across from Island Clothing. I like Lei's and you can find some pretty good items there if you are searching. There is also a good selection of bags and, the holy grail of second hand shopping in Honiara: BOOKS!!! YAY! The prices are reasonable but check out for specials days when everything is half off. China Town shops: there are about three or four good second hand clothing shops in China town scattered around the place. I haven't spent a lot of time there but if you work in China town, its a good place to shop. There are no changing rooms in these shops. Wear a tank top and a skirt to quickly try things on if you must. If you like it, buy it. It will likely not be around when you return. Always wash second hand clothes before you wear it...just sayin. If it doesn't fit, pass it on to someone else. You can arrange to sell items to other people but I always found that to be a waste of time. At less than three dollars an item (N.Z.) its better just to hand it on. Take risks. I found that I bought things that I would have never purchased in N.Z. and it looked great. There was a bit of a gambling element to purchasing in the Solomon Islands; you are never quite sure how its going to work out until you get home. Don't spend too long in there. Its hot and dusty. Its better to go at 10 or 20 minutes at a time rather than a full hour. Don't have an idea for what you are looking for. The best items I found were complete suprises at the time. Just go with an open mind and hope for the best. Take cash. There aren't credit card or EFTPOS operators in these places. There are a couple of first hand shops in the Solomons. My favorite is, by far, Chickaboos in Hyundai Mall. I purchased a few new items but the best part is the wonderful purveyor of the shop, Megan, goes Kaleko shopping herself. She brings back the best from the Kaleko Shops and sells them on. Now, its a little more expensive, you might pay 100 solomon dollars per top (17 N.Z.) but finding Donna Karen and Marc Jacobs without having to sweat in a Kaleko shop is great! Megan has fantastic taste and the shop is a lovely wee place to sit down and have a chat. So if you are busy, don't want to cruise the Kaleko Shops, go see Megan. (Note: friends in the Solomons, if you have any other suggestions, feel free to email me and I will put it on here). So, you might be thinking, this girl goes to the Solomons and just talks about fashion when there is a heap of other issues going on....doesn't she care? Aren't the other things important? Of course I think the issues in the Solomons are important or I wouldn't have spent a year of my life volunteering. For me, at its best, fashion is a way for me to normalise my life experiences. I've worked in a couple of large disasters now and there is always a time, usually in week two or three, that I just stop wearing fluro or jeans or whatever I'm wearing and I want to dress up and look nice. Why? Because it signals to me that life is returning to normal. I notice the same with a lot of my disaster working collegues. Everyone seems to have something they do, whether its getting a haircut or shaving or something that signifies the personal return to normal. 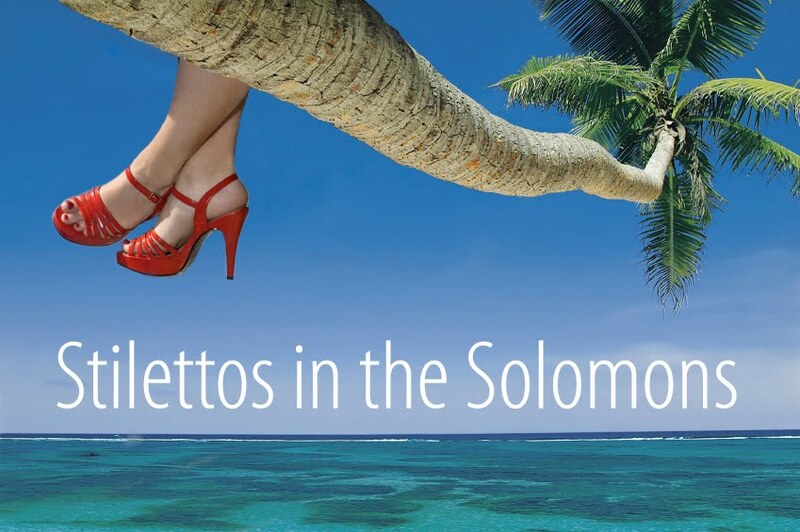 In the Solomons, nothing was like it is in N.Z., so for me, maintaining a personal normal was important. It may sound shallow or stupid but thats what it was for me. Also, you might think, how dare this woman go over and buy perfectly good clothes when Solomon Islanders need it more! You might be right but I purchased items that would have been inappropriate in the Solomon context. For instance, I purchased a great velvet skirt from Leslie Herbert that would have given any Solomon Islander heat stroke. Again, we often send short skirts or warm clothes to the Solomons and its completely inappropriate and no Solomon Islander would want to buy it. I tried my best to purchase clothes that would not have been much use in the island context.